Although the term "enterprise apps" sounds as if these applications must be used exclusively by large corporations, in actuality small businesses can benefit from developing such apps as well. But certainly, the cost of app development can be a barrier to entry for small and independent businesses. In this tutorial, I'll offer some ideas for developing an enterprise app that not only brings key benefits but is actually affordable and achievable for small companies. Let's take the example of a local electrical services company. Its business is made tougher due to the number of large and mid-sized competitors: not only do they have to be good at their job, they must excel in order to sustain customers and grow. The company’s employees usually spend 90% of their working time in the field, which makes it difficult for their managers to control the progress, and for the employees to get by without job-specific desktop apps. Enterprise mobile applications address these challenges and partially make up for the human resources small businesses don’t have yet. Apart from allowing tracking of remote activities in the field, these apps can facilitate communication and contain all kinds of knowledge bases or configuration guidelines. Enterprise apps let employees perform their responsibilities faster and more effectively, keeping customers satisfied and loyal. They also can provide managers with a clearer picture of what's happening and how productive the team is. 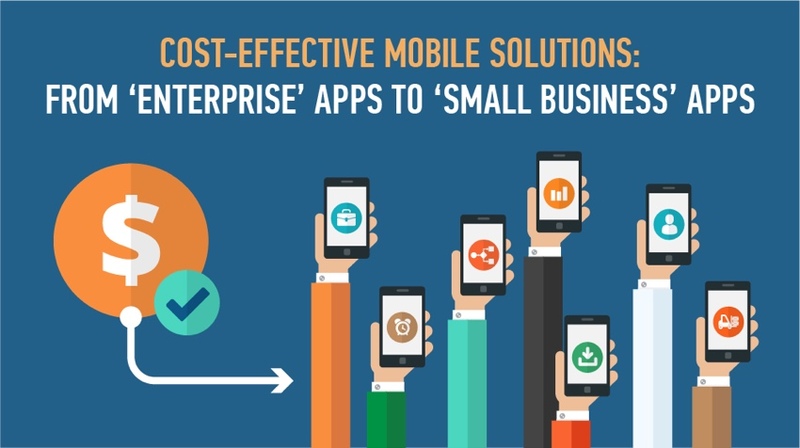 Overall, an enterprise mobile app organizes small businesses’ workflows, increases productivity and, by allowing employees to take advantage of useful data and promptly respond to urgent events, increases customer conversion rates too, growing sales. The key secret to initially launching an enterprise app cost-effectively is reducing app functionality to only one or two features. If you take away only one thing from today's article, please remember that. Choose only the processes that you believe should be improved in the first place and develop your app around useful features for these particular processes. Consequently, development costs will be within your reach. This certainly doesn’t mean that you will be stuck with such basic functionality forever. Iterative software development is always best. Once you get the basic features developed and put the app into service, you can just wait for a couple of months until it proves profitable and provides you budget for the next release on its own. One you've identified the most important features to build into your mobile app, detail your requirements around those. Even if your internal teams have good product management skills and you're thoughtful about cost cutting, choosing the wrong development vendor can lead to problems. Frankly, it helps to have a mobile development expert to help you. Before proceeding to the development stage, we advise you to make sure your partner vendor is able to discuss your project in details and will manage the application lifecycle to the very end. Cross-platform mobile development not only makes enterprise applications available for all employees whatever devices they use, but also reduces costs significantly. Today’s hybrid and cross-platform development frameworks have already caught up with native technologies and offer from 70% (Cordova, Appcelerator) to 100% (Xamarin) native experience for Android, iOS and Windows phones at reasonable prices. Development of an application with an average functionality on the hybrid Ionic framework, for instance, can provide you with a slick UX and 85-95% performance compared to developing natively within each framework. If you’re planning to develop several apps at once, there’s a high chance that you will be able to reuse some features. In other words, if the feature is developed for one of your company's applications, migrate it to your new app's functionality. Think DRY (don't repeat yourself) at the application level. For instance, you can develop a mobile app with a 3D presentation of your major product—and then make only minimal changes to adjust the presentation to another product you’ll want to bring to the fore in your marketing campaigns. Needless to say, you save both money and time with each new application. Again, choosing the right vendor has a huge impact on outcomes. The ability to reuse features can be overlooked entirely when your vendor isn’t competent in your business analysis. Other times, your app may be left hanging in the air when it turns out that the vendor can’t perform integration with the systems you have. Integration means making your app freely communicate with your existing business solutions. It does affect development costs, but is basically the same kind of investment in the future as an application itself: you pay once and watch it carry value forward into the future. Integrating an app with your existing solutions such as ERP, CRM and CMS allows easy uploading, downloading and interconnection of any and all of your information. This kind of data exchange will speed up the workflow and eradicate tedious re-input tasks for your employees. If successful, your teams and customers will become increasingly reliant on and demanding of your applications. Share your plans with them early on. Ask them for ideas. And integrate their requests into the application over time. As you can see, enterprise applications can be closer to your small business than you thought. Using these guidelines, you can devise a strategy that would help you cut development costs and still build quality mobile applications. ScienceSoft welcomes your further questions on the discussed matters and gladly offers you professional guidance. Want some guidance? Request a quote from ScienceSoft for your mobile application today. ScienceSoft is a full-cycle software consulting and development company headquartered in McKinney, Texas, that branches out mobile development as one of its major competencies. With 11 years of mobile experience, the company has delivered over 300 successful projects and is known for industry-specific solutions for enterprises and mid-size businesses in Healthcare, Telecommunication, Retail, Banking and more domains, featuring such end clients as Burger King, Orange, T-Mobile, Viber and MTV. Their team of 75 mobile consultants, developers, UX/UI designers and testing specialists provide full-stack services using both native and cross-platform technologies, including Xamarin and Cordova. ScienceSoft offers native mobile development on Android, iOS and Windows Phone by developers with experience measured by dozens of projects. Moreover, the company is continuously extending the number of showcase projects in cross-platform mobile development and offers you Xamarin and Cordova mobile development. Head of Android Development Department at ScienceSoft. Andrei has over 10 years of experience in programming and designing mobile and web-based solutions. His track record as a project manager includes mobile development for Viber, a VoIP app with 600 mln users worldwide, and Bellator, America’s leading Mixed Martial Arts organization, as well as delivering of the award-winning banking solution for a European bank. Envato Tuts+ writer Jeff Reifman also contributed to this article. Decoding the iOS 6 SDK Available Now!